Muddy Paws & Inky Fingers: Turquoise -- some words are hard to spell! If you are looking for the Get Inky! Stamps hop, please click here. If you are looking for the Craft Lovin' Challenge Blog Post, click here! Happy Saturday All That Stickles fans! We're in the middle of the turquoise linky party and it's my day to share a little inspiration over on the All That Stickles blog. I had so much fun making this card featuring turquoise Stickles. I used turquoise Stickles on the big flower and on the ribbon, there's Star Dust Stickles on the smaller flower. The silk ribbon started out white and so did the largest flower. I dyed them to match with Tim Holtz Peacock Feathers distress ink and turquoise Stickles. Pretty cool, hunh?!? Love how they match the one girl's dress. 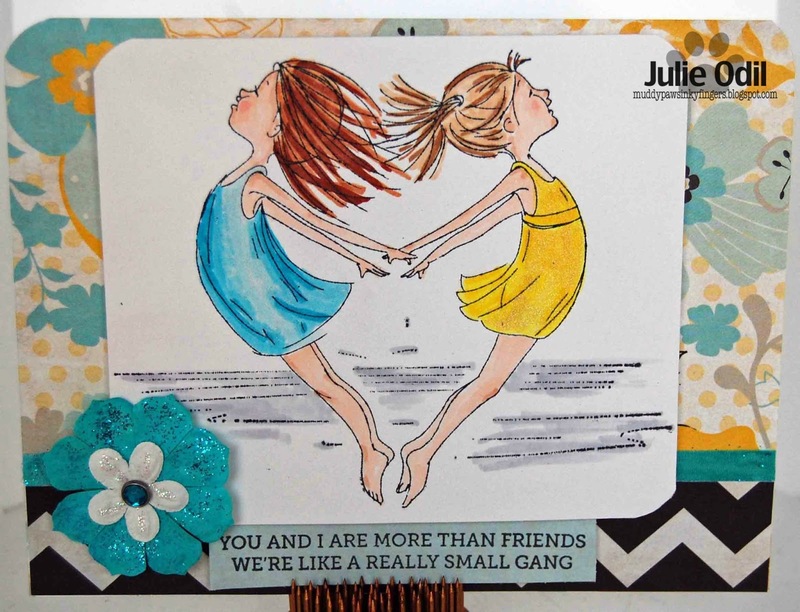 And, speaking of girls, they are a Unity/Phyllis Harris stamp, "The Heart of a BFF". The sentiment is from Mama Elephant Stamps. I stamped the girls on Cryogen paper with Memento black ink and colored them with Copic markers. I used some Creative Inspirations paints in Fairy Dust on the girls' dresses to make them shimmer. The card is 6 1/2 x 5 inches. I used Fancy Pants Park Bench 12x12 papers. The flowers are Close To My Heart. The brad is a My Mind's Eye Indie Chic. Very cute! I love PH images! Great use of the Turquoise Stickles! Your ribbon is all stickley too! Love Love! Great card! I love the combination of the image with that sentiment! Congrats, Julie, on making yet another DT! I'm going to miss working with you at CC . . . but as they say, "All good things come to an end." Though maybe we will be able to work together again. On another note, Love your work . . . especially the card. Maybe it's because I have that stamp, too? Whatever it is, you did a GREAT job! Great coloring and I love the sentiment. Thanks for playing along with us in the the Anything Goes Challenge over on the Simon Says Stamp Challenge Blog this week! Beautiful creation! thank you for joining us over at the Sister Act Card Challenge.